See those hills? 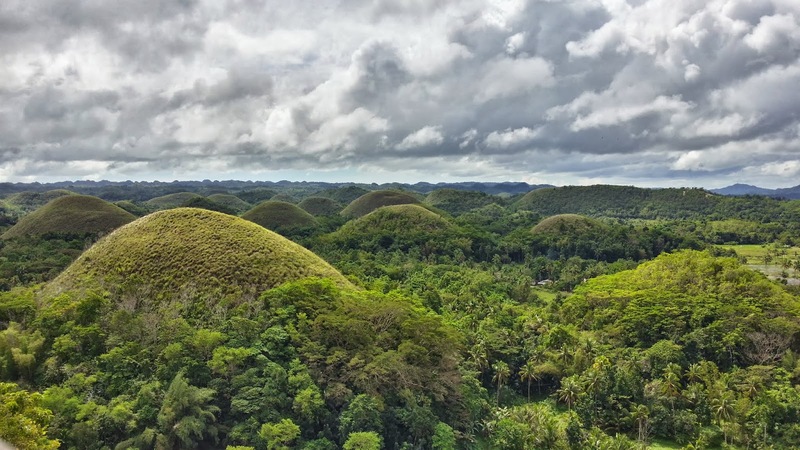 Those are the famous Chocolate Hills of Bohol. We were informed it was okay to go there. Booking the tour was easy. A man at the Isola Bella Beach Resort asked us if we wanted to take a tour. One of Jackie's friends had recommended going there, so we said we would like to check it out. By the early afternoon, a car showed up to take us. The driver gave us a list of places we could go to and what would be the best chance to see everything. He took into account the weather and crowds. He seemed to know what he was doing, so we chose a few places we really wanted to see and headed out. 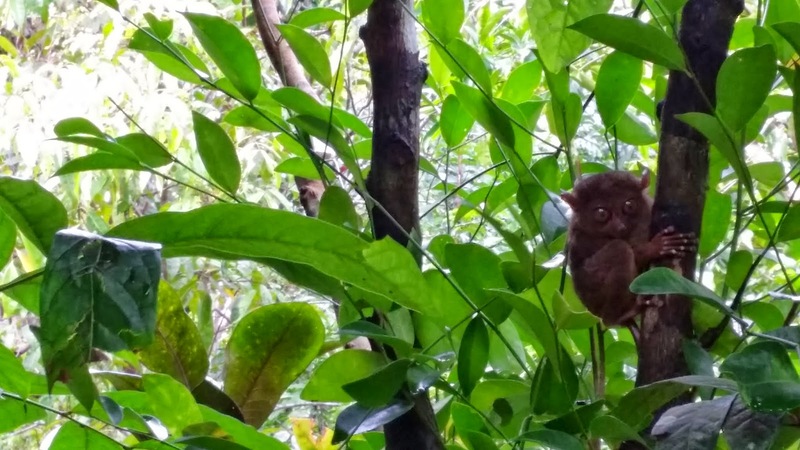 Tarsiers: The Cutest Little Things! Look at those cute tarsier eyes! We did have to stop for gas not soon after, but other than that, it was a seamless drive from Panglao Island to Bohol and to the tourist places. First, we stopped at the Tarsier and Wildlife Sanctuary. I had never heard of a tarsier before and did not know what to expect. Tarsiers are little primates that can fit in the palm of your hand. They have large eyes that take up most of the face. These little guys are so furry too! Their little hands have long, skinny fingers with little bulbous fingertips. Similarly, their toes are are long and skinny, but also have one larger toe. During the day, they mostly sleep. 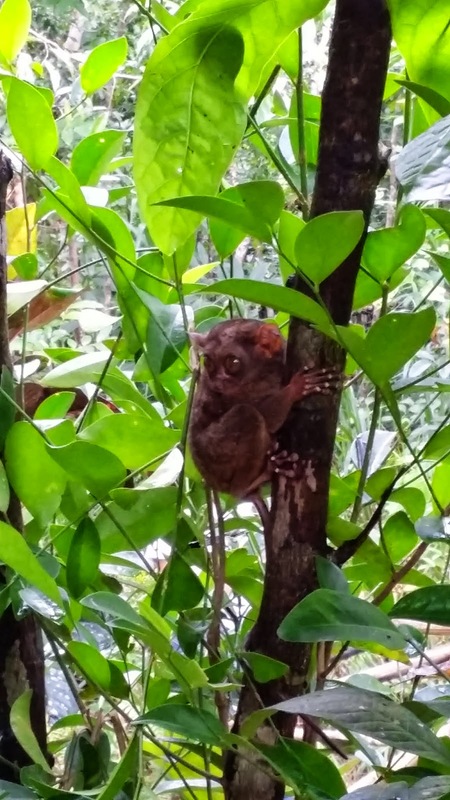 Because the tarsiers are delicate and have been greatly affected by humans, they are starting to disappear. 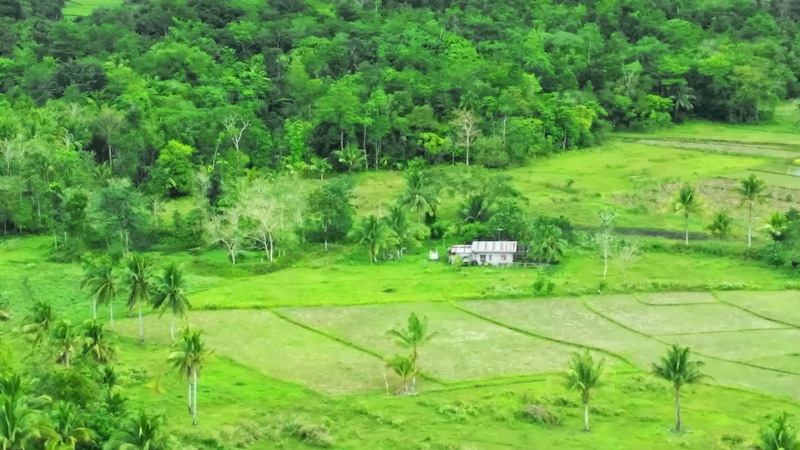 Sadly, while I was researching for this article, I learned that there are two tarsier conservation areas. One is the official one run by the Philippine Tarsier Foundation. 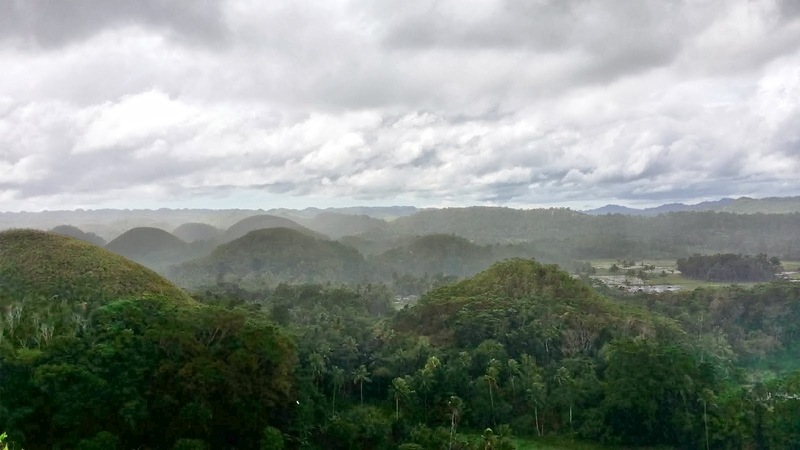 The Philippine Tarsier and Wildlife Sanctuary is located in Corella. 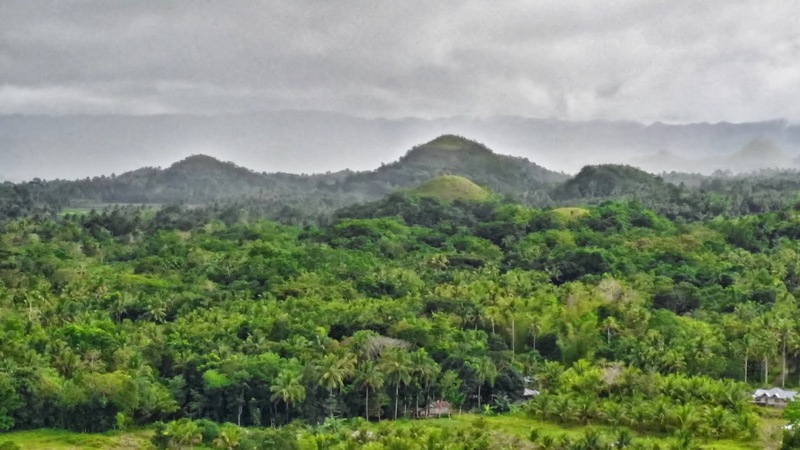 The other one is called the Tarsier Conservation Area and is located in Loboc. It is more popular because of the location, but they do not treat the tarsiers as well. It seems that, while it is getting better, at one time all the tarsiers were kept in cages, now they are not chained up. The tarsiers will actually bash their heads against a cage until they die. Sad. I am disappointed I did not go to the good one. We had no idea that this issue existed. It is obvious why they are so sought after; these little guys are ridiculously cute. As for the conservation area, you are given a briefing about the rules and then allowed to walk down a path that is slippery. 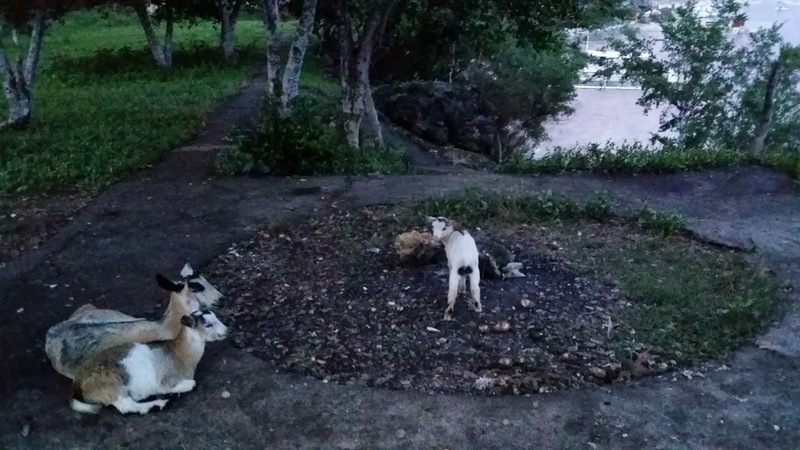 Five tarsiers are along the path (I guess I should have known that these nocturnal animals wouldn't simply set up shop where they could most be seen). An employee stands at each station that is marked with a ribbon. They will point out the tarsier for you. Currently, you are not allowed to touch or hold the tarsiers. You are also not allowed to use a flash from a camera, but I still saw one man do it anyway. 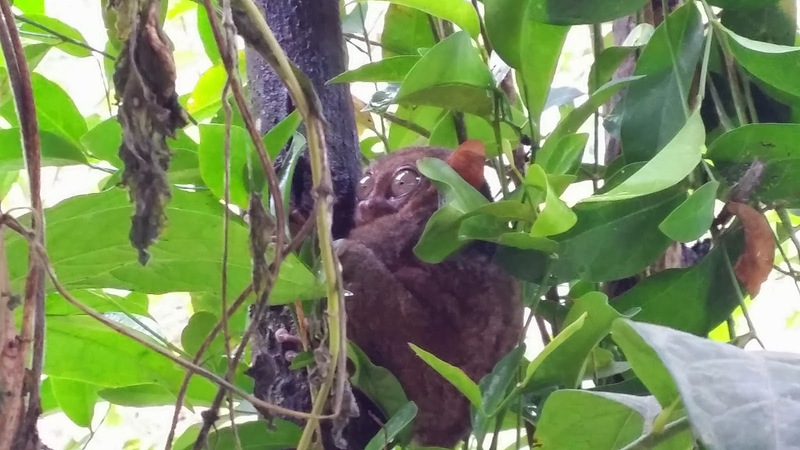 The tarsiers are supposed to be sleeping during the day, so this is quite rude and destructive to their natural being. Time to Be Happy Again: Butterflies! 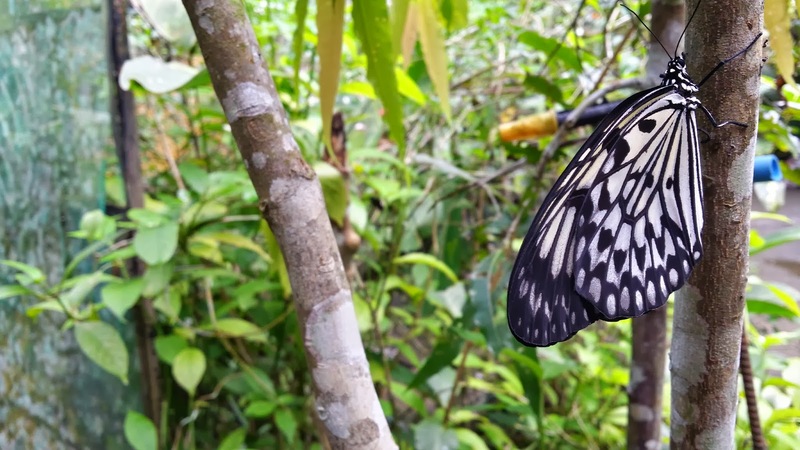 We were in a good mood by the time we got to the Simply Butterflies Conservation Center. Once again, the price for admission was very cheap. We were put in a tour group with a few other people and sent on our way. The tour guide gave us a great amount of information about the butterflies while also telling jokes along the way. He was actually very funny! We were all allowed to hold a couple of caterpillars. A little while later, we had the chance to see a butterfly emerge from its chrysalis. 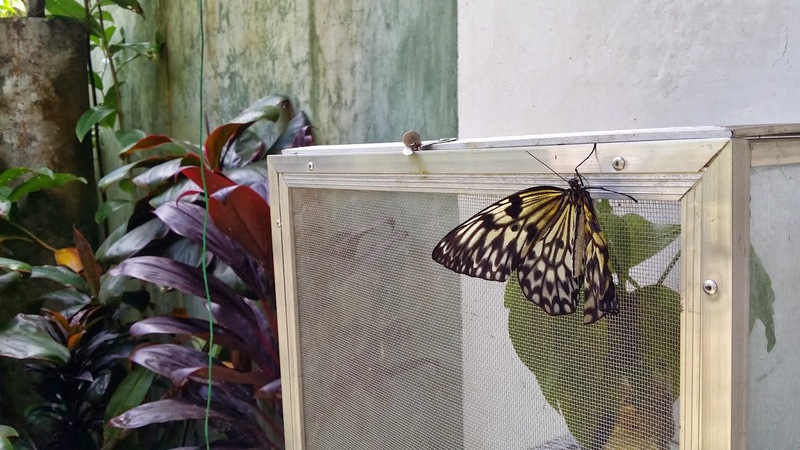 They had a whole cage of different types of caterpillars changing into butterflies in various stages. Welcome to the world, butterfly! After this area, the guide took us to the main area, which was swamped with butterflies flying every which way. +Jackie Eckles and I walked around and took pictures. 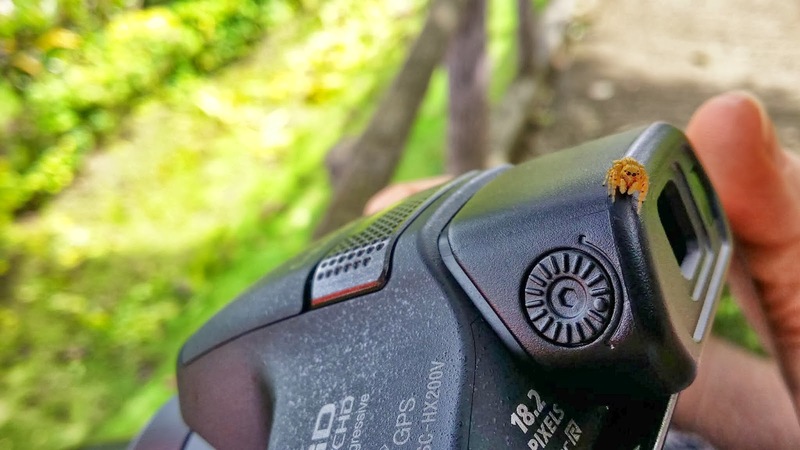 When the guide caught up to us, he put butterflies on us! It was strange, but fun! 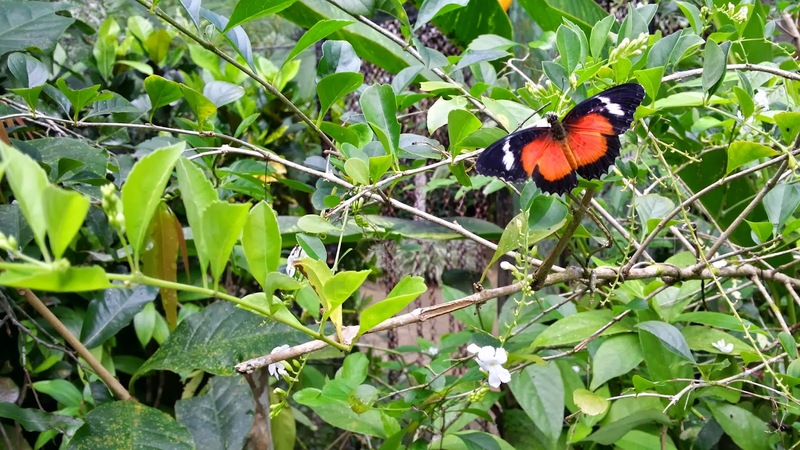 Some of the butterflies were very colorful. 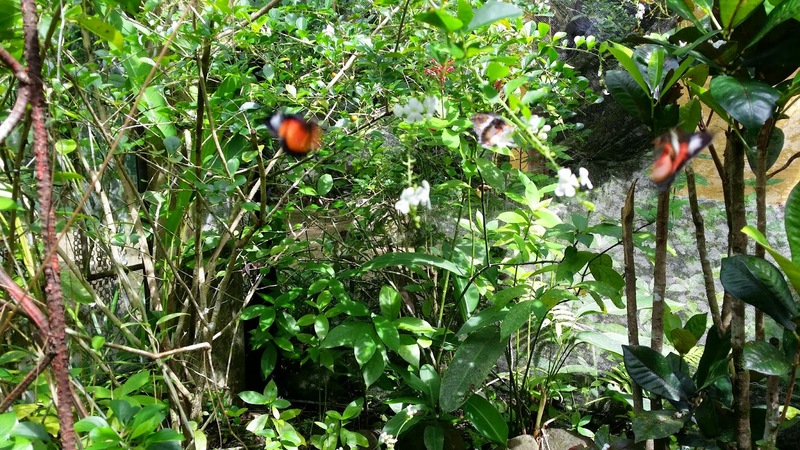 There were many more butterflies flying everywhere. The tour lasted a rather short time, but I didn't care. We had a lot of fun playing with the butterflies. They have a restaurant that serves up normal food (you don't eat butterflies or anything crazy like that), an outdoor picnic area that looks rather peaceful, and a souvenir shop. However, we wanted to get to our next destination. 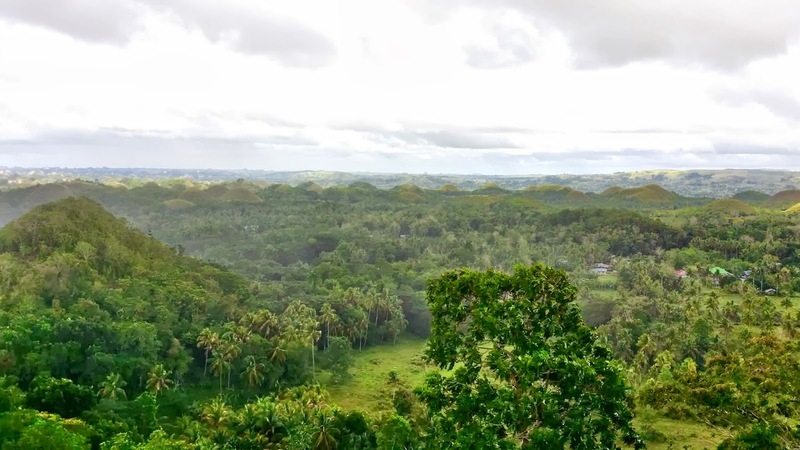 Now came the main attraction: the Chocolate Hills. We drove up, down, and around all sorts of beautiful places. We passed through the Man-Made Forest, between small towns, and through big green fields. The driver drove much faster than the posted speed limits, but I never felt like he was out of control. Once at the entrance, we walked up many stairs to the top viewing area. 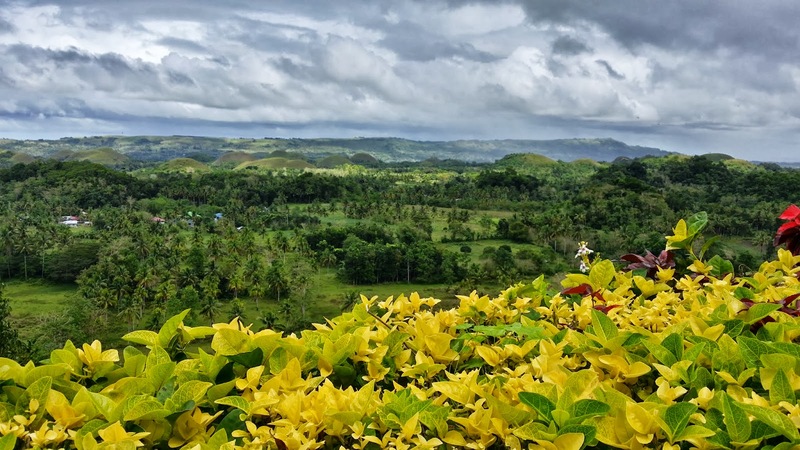 From there, you have an expansive 360 degree view of Bohol. 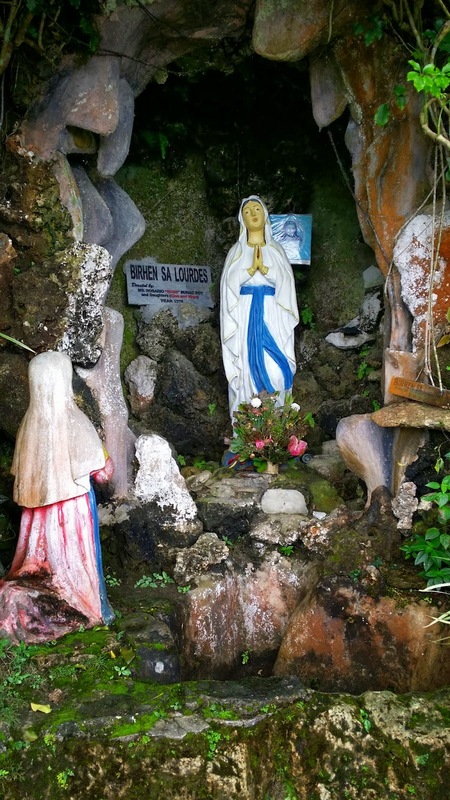 Other than the church earlier, this was also the first major evidence of the massive earthquake which ravaged the island. 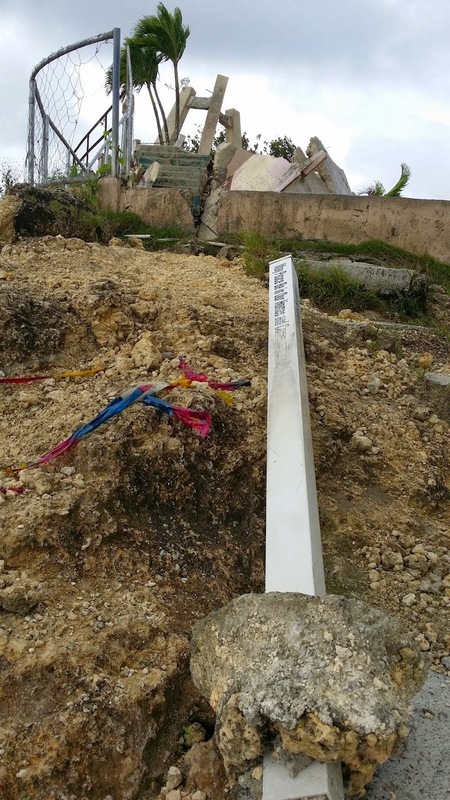 The area at the top was basically demolished. A bell sat on rubble. Signs directing tourists laid strewn on the ground. A fence hung off the edge of the cliff. A hole allowed me to peek down into what looked like an administrative area one level below. Pens and papers still remained stuck there. It says not to go beyond the line, but we did anyway. More destruction. And you can see it raining in the background. 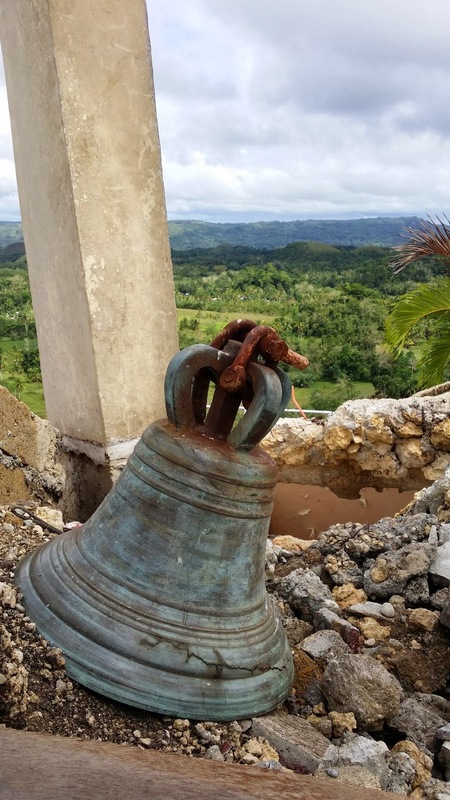 The fallen observation deck bell at the Chocolate Hills. 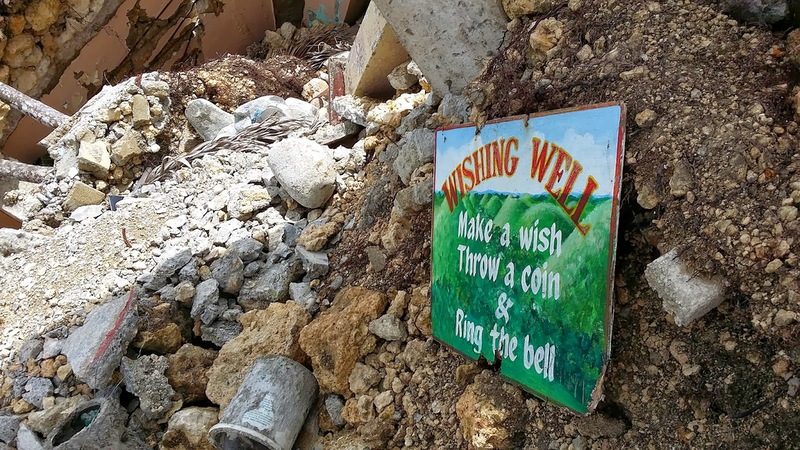 The wishing well is no more. 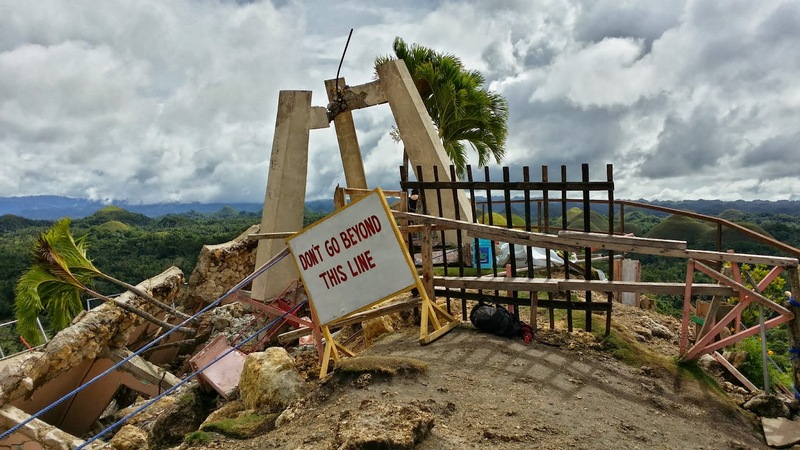 "May Peace Be in Our Homes and Communities"
A couple of people went under the fence erected to keep tourists out of a dangerous area, and there was no security around, so we decided to check it out as well. 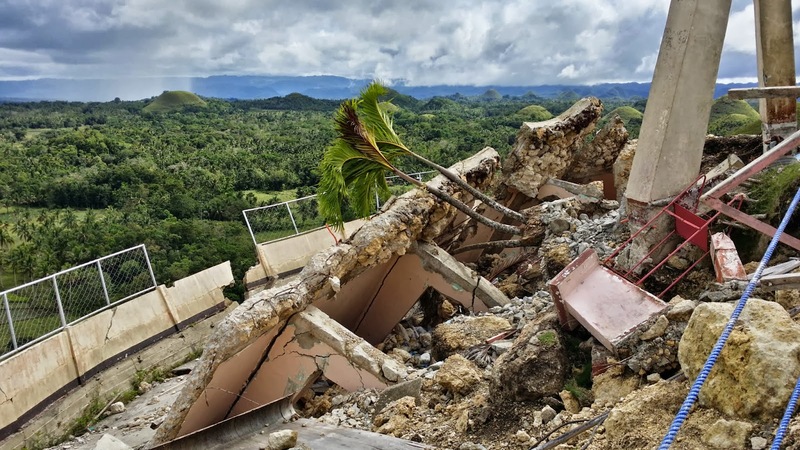 On the other side, we were able to see even more destruction to all of the buildings on the mountain. Still, with vibrant colors and incredible warmth, the landscape appeared untouched for the most part. Shades of green surrounded us. 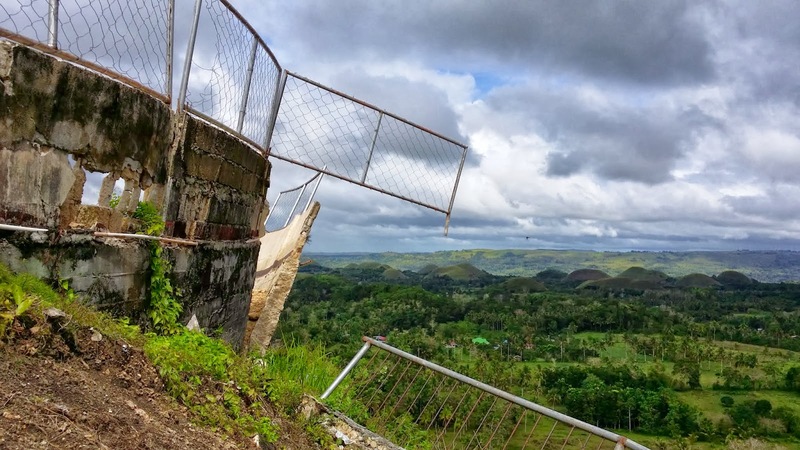 A lot of the observation deck has not been repaired yet. 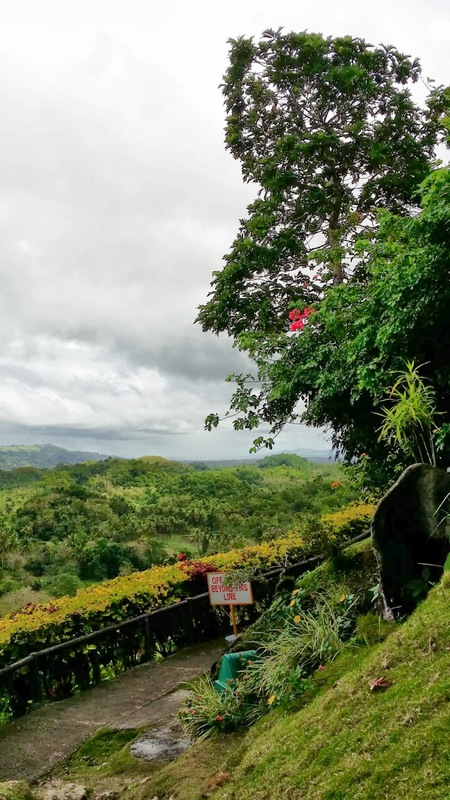 Spending time at the top of the mountain was relaxing, something that was getting to be normal about being outdoors in the Philippines. However, we had to get back. As we were starting to leave, a security guard came by and told us we couldn't be there. He asked us if we had seen the sign. I apologized and claimed not to. He didn't do anything though. Down the stairs we went, stopping to take more pictures. Halfway down we found a shrine and a little spider friend. We declined to go to any of the other places, so the driver took us back. From the resort, we went out to hitch a ride with one of the tricycle motorbikes back to Alona Beach. It began raining on us as it had threatened to do all day. Luckily, we were able to take shelter until an available ride passed. While there, we grabbed some more pizzas at Hayahay Pizza like on the second day of the vacation. It had been really tasty then! Unfortunately, just like last time, they had run out of grapefruit and were unable to fulfill Jackie's drink order. The pizzas were still good though. We suddenly noticed we were running low on cash. I had brought my credit card, but no place in Alona Beach took any cards. It was incredibly frustrating. 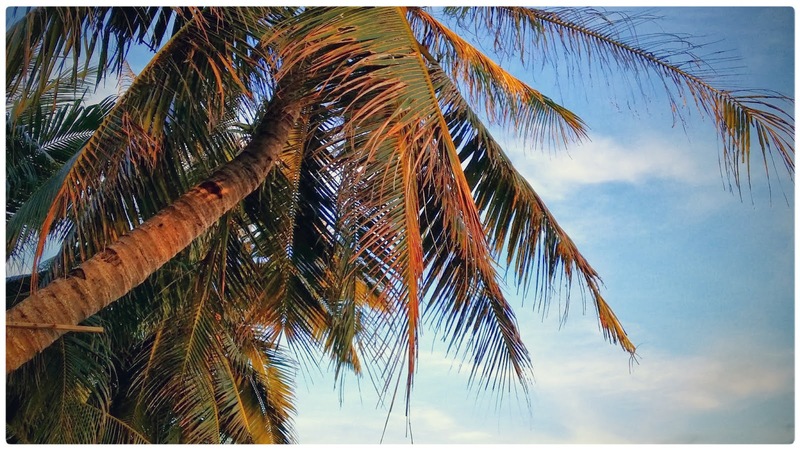 The only place we had been that accepted credit cards was the Alona Tropical. So we went to the nearby bank and ATM. I was asked to give a pin number for my credit card. Now, I've taken cash out before with my credit card and have never been asked to give a pin number. Jackie went into the bank and I followed soon after. She wanted to call the 1-800 number on her card, but the tell said their phones did not dial out of the country at all. Incredibly frustrating. We went next door to a tourism shop. I was weary of the place because I figured it was there as a last resort and would take advantage of that. Luckily, they were able to give us the money with no real problem. It didn't seem to be too much of a rip off either. And now, armed with extra cash, we could get back to relaxing. Jackie went to get a massage on the beach. I hit up a bar and had a gin and tonic while I caught up on reading the blogs I follow. When she was done, we saw that the sun was setting. We had to get there in time! We ran to get to a place where we could actually see the sun descend below the horizon. Unfortunately, the construction of a new, gigantic resort stopped us. Changing our plans, we just tried to get as close as possible. 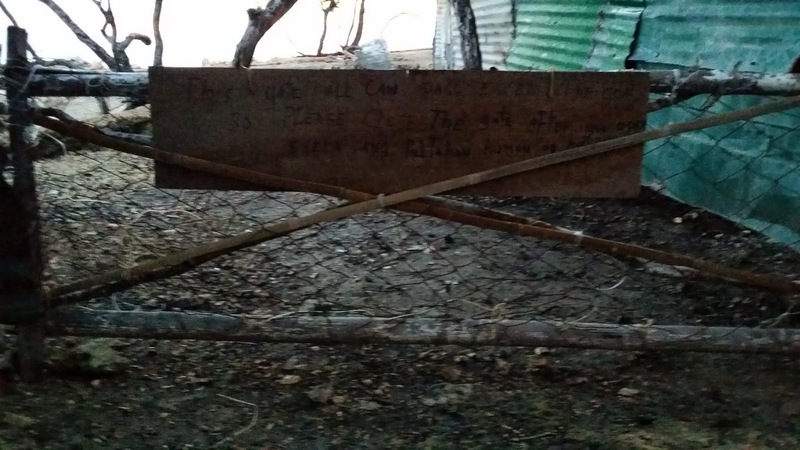 At one point we came to a gate with a sign which told us we could enter as long as we closed the gate behind us in order to keep the goats out. Ha! "This gate all can pass except the goat." 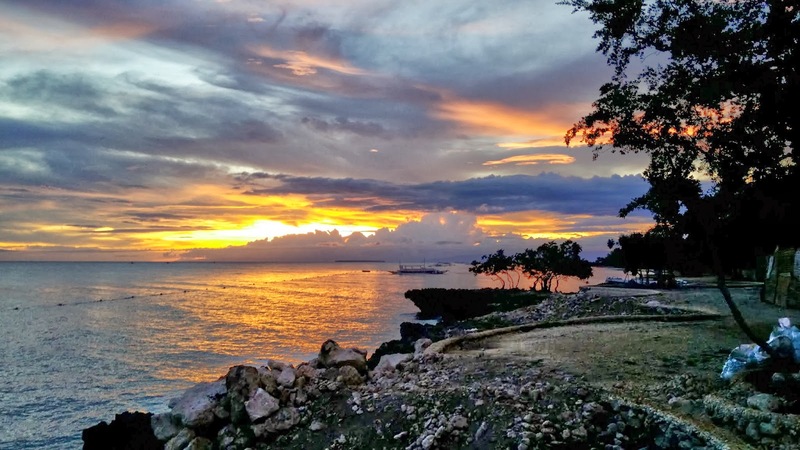 The sunset near Alona Beach. Not too shabby. From there we watched the sunset. 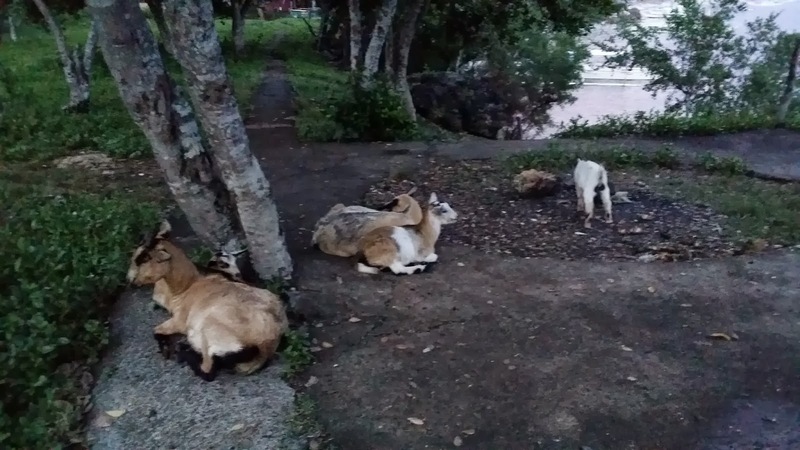 Then we hung out with the goats. Eventually, we started to get hungry, so we looked for somewhere to eat. Back at Alona Beach, we stopped at a little place on the beach. I can't remember the name, but it's toward the end of where all the restaurants are located. There, we ordered a couple San Miguels and had some bratwurst. The owner, a large, friendly American man with a white beard, came over and talked to us about how he came to live and work in the Philippines. His son is the cook I believe. The food was great. All night, Neil Diamond music played, mostly his really early stuff. It was a cool scene. Finally, we putzed around a bit before heading back to our room for the night. 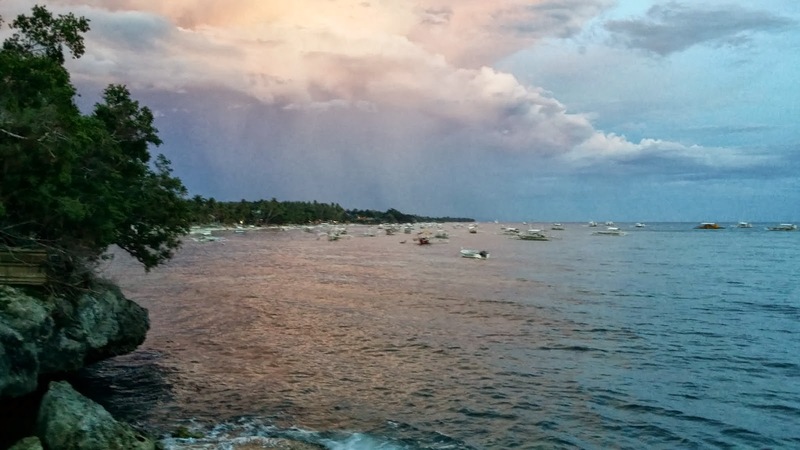 It would be our final night on Panglao Island. We had a five-star hotel waiting for us for our last night in the Philippines!